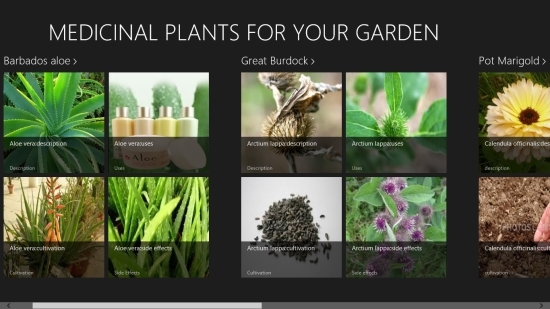 Medicinal Plants For Your Garden is a free Windows 8 Gardening app that carries useful information about some medicinal plants. 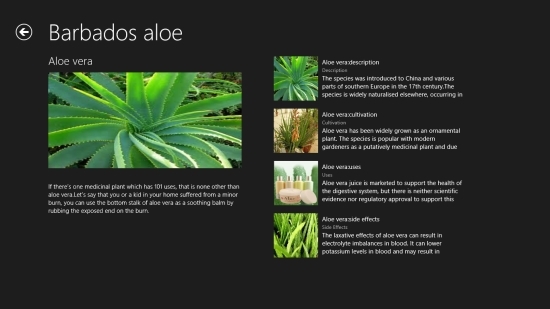 Using this free Windows 8 Gardening app, you get to know about the useful medicinal plants such as Aloe Vera and Pot Marigold, which you can grow at your home. It is an informative app that tells about medicinal plants, their uses, cultivation method, and side effects. If you like gardening and are curious to know about some useful plants, the app will surely be of your interest. Medicinal Plants For Your Garden is freely available in Health & Fitness category of Windows Store. You can also view the app directly in Windows Store by clicking on the link given at the end. Let’s see how you can use this free Windows 8 Gardening app. To access information from the app, you need to install and launch it on your Windows 8 system. The main page of the app looks very beautiful and lively. The pictures of plants and flowers appear in a tiled interface divided into four categories. Each category displays information about a plant, its native habitat, detailed method of cultivation including the soil, climate and harvesting details, its medicinal uses, and possible side effects. As you click on a category, the next screen will display beautiful picture of that plant on the left side of the screen. The related information including Plant Description, Cultivation, Uses, and Side effects will be displayed as pictures and a little description on right side of the screen. Click on any tile to open and read the information contained in it. Use back arrow button placed on the top right corner of the screen to go back to the main screen. Also try Home Doctor and EatSmart. 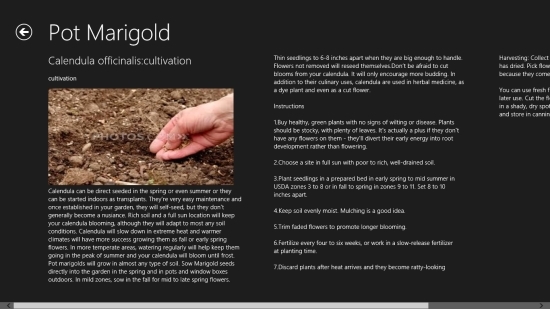 Medicinal Plants For Your Garden is a nice Windows 8 free app that provides useful information about some medicinal plants along with their detailed method of cultivation. You can easily grow these plants at your home. Give this app a try. Share your feedback via comments. Get Medicinal Plants For Your Garden here!